Students explore future career options by listening to guest speakers from their prospective professions. Photo by Amy Blevins. As seniors leave RBHS they are looking onto many obstacles, tackling college decisions, fretting over sky-high tuitions, and deciding what career they wish to pursue. The RBHS family has helped students make these big decisions, along with ensuring students have a fun and memorable high school experience to look back on. [tabs] [tab title=”Seniors reminisce”]As events stand out from the millions of other people have experienced, their brains record the moment as their neurons code the sights and feelings they take in, allowing them to recall the event in the future. Later they might desire to re-experience these stored memories. Their brain kicks into gear, relaying the long strings of neural patterns. Scientists call this phenomenon the act of recalling, but laymen commonly refer to it as remembering. When senior Whitney Cravens reaches into the crevices of her brain’s memory center to retrieve the senior prank pulled at RBHS, her brain replays some of her favorite neural patterns. Cravens said she loves the laid-back nature of RBHS and the faculty’s desire for all the students to have a fun, meaningful high school experience. This lifestyle has allowed Cravens to relish her time in high school and share boisterous moments with her classmates. RBHS is known for the talented and outgoing students who are not afraid to get up on stage, like the Milk-men. Senior Hannah Sage, who is one such student, has been a member of the Satin n’ Lace Show Choir for the past two years and was a tech her sophomore year. Sage said she will always remember show choir competitions filled with makeup, frilly costumes and, in the end, tears. Not only are the performing arts at RBHS distinguished, but the sports’ programs also have legacies to uphold. One team that continually competes well is the cross country team. 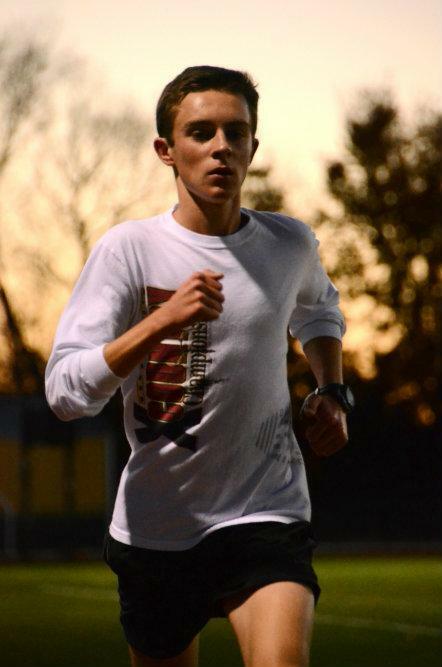 Senior Evan Schulte, a varsity long distance runner, watched his team stomach losses and revel in astounding wins. Senior Evan Schulte runs during a cross country practice. Schulte has enjoyed his time on the team and the friendships he has made. Friends are what truly make the high school experience unforgettable. Whether students met their best friends on the field, singing, or at a school-wide event, each student connected with someone who made their high school experience a little sweeter. Leaving friends and family and venturing into a world full of uncertainties is hard for everyone, some more than others. While Cravens treasures her memories of RBHS, she is eager to make new memories at the University of Alabama. Making the choice to leave or stay home is, for many high school seniors, the biggest decision they will encounter. Big colleges bursting with opportunities are found a few feet from home; others are 1,000 miles away. A UCLA study reveals colleges’ academic reputations, percentage of graduates who get good jobs after graduation, financial aid, campus visits and tuition costs greatly influence students when they plan the next four (or more) years of their lives. Counselor Rachel Reed sees the complication of the decision and the multiple facets of choosing a college when students come to her for guidance. Senior Advanced Placement student Joanna Zhang has always strived for good grades in hard classes. Her mentality to succeed under pressure, her GPA and her desire for a rigorous and substantial education influenced her decision to mostly look at selective colleges. She applied to seven different, high stakes schools. The process was exhausting, she said, but her preparedness helped her. Her endeavor was not cheap, either. College applications fees are normally around $35, but there are prestigious colleges that have fees that are up to $85. Zhang was not just ready for the battle beforehand, but she also made sure her work was the best it possibly could be before she sent it away to be read by the harshest graders, college admission officers. After the process was finished, all that was left to do was wait. The results reflected Zhang’s supreme planning skills; she was accepted to two of her top colleges, Princeton and Duke. She struggled deciding between the two; both were excellent universities that offered her exciting possibilities. While Zhang is traveling to the East Coast, senior Joshua Baumer is attending Missouri University of Science and Technology in nearby Rolla, Mo. Instead of making his college decision based on academics, senior Jason Keihne made his choice from an athletic standpoint. His experience was far from stressful because of his laid back and open-minded nature, along with his clear desire to wrestle at a collegiate level. Keihne finished this season ranked 8th in state, so finding a college with a wrestling program that wanted him was not hard to come by. Distance was also a key factor in his decision. What will/has affected your college decision? Are you scared of leaving home, or anxious to get away? After students spend months applying, making the grueling decision of which college to attend and mentally preparing themselves to go to a place where everyone will be a stranger, students also have to choose what to major in. While some students simply don’t know and might choose to be undecided, others know exactly what career path they would like to chase because they took a specialized class at RBHS. With a plethora of Advanced Placement classes and Columbia Area Career Center classes offering real-world experiences, students often find a topic that ignites their interest. Senior Subah Mohua has wanted to be a teacher ever since she was little, but her experiences at RBHS sparked her passion in a specific subject area. Mohua took advanced English classes, and encountered rich literature that captivated her attention. She found her knack in crafting the different essays she learned to write in AP. Mohua is also a member of the Intersection core group of Rock Bridge Reaches Out. Members of the club travel to the Intersection building across from Hickman High School to work with children after school and teach them life lessons they may not be getting at home. In addition to participating in the club, Mohua was also Neal Blackburn and Katherine Sasser’s teacher’s assistant for AP World this year. Mohua picked to work with this class specifically because she enjoyed her experiences with Sasser, loved English and appreciated the advanced nature of AP World. While the class was a lot of work, helping was eye opening for Mohua. “It has been a lot of grading papers but I guess I should get used to that,” Mohua said. While Mohua plans to pursue teaching, senior Charlie Gan intends to major in environmental engineering at Georgia Tech to study the challenges that must be overcome to promote a clean and functional environment for everyone. Gan found inspiration for his major in AP Environmental Science. The class taught Gan about the Earth and all the issues humans create for the planet, along with solutions to these problems. This class has not only gifted Gan with his college major, but a clear future plan. Gan knows exactly what career he would like and what the next ten years of his life will entail. Senior Sarah Ashbaugh also fell in love with the sciences while attending RBHS. Next year she will attend Grinnell College and major in biology with a concentration in neuroscience. Ashbaugh discovered what the world of biology was really like with hands-on experiments. Her favorite experiments included one with brine shrimp and another with gel electrophoresis. It taught her more than how to mindlessly memorize facts. CACC and the AP classes offered at the school introduce students to fields of knowledge that allow students to have extensive background information in college and helps students make hard decisions between subject areas. AP Biology teacher Kerri Graham sees how pertinent information in her class is to students pursuing science careers. Graham said her job is so fun because she gets to watch students become excited about learning and begin to use memorized information while going deeper in the subject, rather than just spurting out facts. This active use of knowledge helps students realize what they want to pursue. Have you taken classes at Rock Bridge that sparked your interest in a certain career path? Which classes?